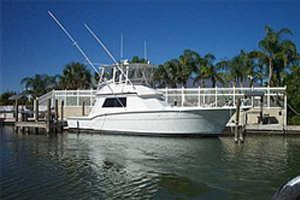 K&A Charters is known as the guys to go to when it comes to chartering a high quality, a super clean fishing yacht in the South Florida area. From the Florida key to West Palm Beach, you can count on K&A Charters for the finest charter fishing fleet in South Florida. 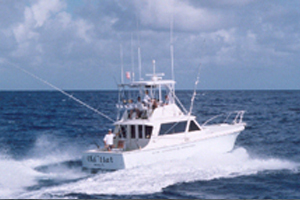 The 44′ Hatteras is truly a one of a kind sportfishing machine. Originally built in the 1960’s by Hatteras, she has gone through a complete refit. Her owners have carefully restored her grace and beauty while upgrading safety and connivance systems wherever necessary. A few of her upgraded creature comforts include central air-conditioning throughout and a complete entertainment center with color TV, VCR, CD player and ice maker. This modern classic has been re-powered with twin Cummins diesel, and is equipped with all the latest fishing tackle and electronics. “She is a proven tournament winner”. Whether it’s catch and release or finding the trophy fish, this boat is for you! Her state of the art electronics package (including GPS, radar, autopilot, color depth machine, VHF and SSB radios) make her a safe, comfortable convertible cruiser. A true modern classic. 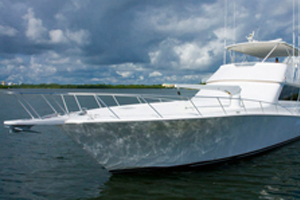 This 45′ Hatteras Sportfishing is a super fishing machine. Whether you plan a day of fishing or a trip to the Bahamas, the 45′ Hatteras and her very experienced crew are what you are looking for. Once aboard, you find creature comforts topside and below. Her bridge deck is the perfect place for sightseeing or spotting the big ones. Below you will find the very spacious main salon and full galley area. Of course, you will enjoy your favorite reggae music, sporting event or video movie courtesy of the built-in entertainment center. If big game fishing is your passion, then look no further. The captain has won numerous billfish tournaments and knows all the hot spots. 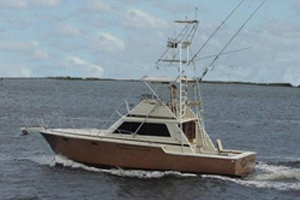 This 58′ Classic Wooden Sportfishing is fully air-conditioned and rigged for the big ones. Charter rigged with 4 fighting chairs in the cockpit and 2 on the bridge. 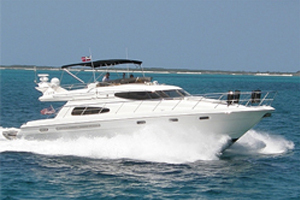 One of the largest cockpit and bridge decks available on any sportfish in her category. Her crew has over 35 years of big game fishing experience. A proven fish raiser, the Therapy is a winner. Complete tackle for all types of fishing. Direct TV / DVD / Stereo /Full State of the Art Electronics.